The collective miles driven in the United States dropped by 1.4 billion, or 0.1 percent, to an estimated 1.46 trillion in the first half of the year, the Federal Highway Administration said this week, extending declines in recent years. Despite a steady rebound in U.S. new-vehicle sales, modest job growth and an improving economy, Americans continue to drive less. In June, the latest month available, miles driven dropped by 900 million, or 0.4 percent, to an estimated 258.1 billion miles, the federal agency said. 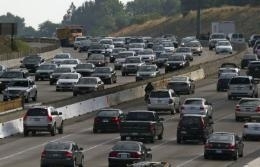 The government estimates Americans drove 2.94 trillion miles in 2012, down from 2.96 trillion miles in 2011. Miles driven by U.S. motorists peaked in August 2007 at 269.3 billion and took a nose dive during the Great Recession as economic concerns and high unemployment discouraged Americans from getting behind the wheel. Also, fewer younger Americans choose to get driver's licenses and own a car. Total vehicle miles driven should slowly begin to rebound, mirroring economic activity, said University of Michigan researcher Michael Sivak. "With the improving economy and the expected increase in the U.S. population," Sivak said, "it is highly likely that from a long-term perspective, the absolute number of vehicles has not yet peaked."